Whenever a script is submitted in the industry, it is passed off to a reader for analysis. The reader will give the script a “recommend,” a “consider” or a “pass.” And unless it gets a recommend, probably no one else is going to look at it. Corey Mandell is an award-winning playwright and screenwriter who has written projects for Ridley Scott, Wolfgang Petersen, Harrison Ford, John Travolta, Julia Roberts, Warner Bros., Universal, 20th Century Fox, Fox 2000, Fox Family, Working Title, Paramount, Live Planet, Beacon Films, Touchstone, Trilogy, Radiant and Walt Disney Pictures. 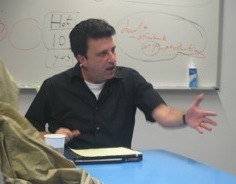 Corey teaches screenwriting at UCLA and offers private online classes using real time video conferencing.